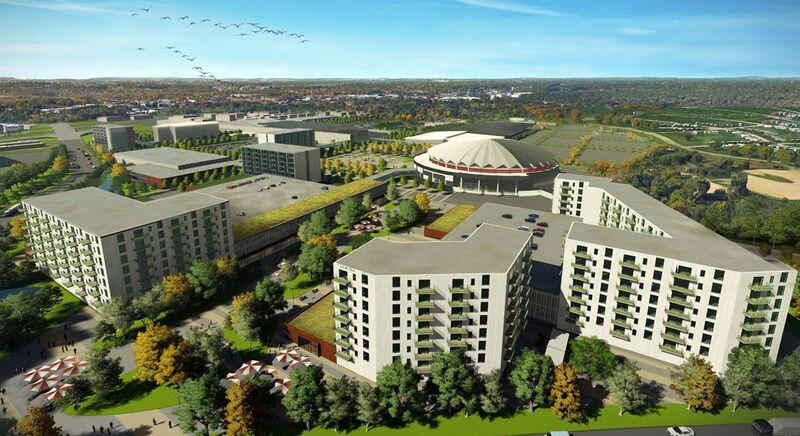 The planned redevelopment of the Alliant Energy Center is one of the Dane County Board's top initiatives for 2019. As January unfolds, there is real excitement in county government about the possibilities of the New Year. The Dane County Board will address many varied issues in 2019, but I want to focus on three key initiatives: water quality improvement, Alliant Energy Center campus redevelopment, and inclusive community engagement. On water issues, the board will implement recommendations of the Healthy Farms, Healthy Lakes Task Force to reduce farm runoff that impairs the Yahara Lakes watershed. The importance and urgency of addressing runoff was underscored by the record rainfall and flooding this past summer. This effort marks the first time farmers, environmentalists, scientists and policy-makers have come together to work toward reducing phosphorus pollution while encouraging better agricultural conservation practices. The recommendations include implementation of state agricultural performance standards such as tillage setbacks and nutrient management plans, at the local level. The 2019 budget includes staffing and resources to implement the recommendations. Information on Healthy Farms/Healthy Lakes is available at https://board.countyofdane.com/Healthy-Farms-Healthy-Lakes-Task-Force. Regarding the Alliant Energy Center, we have completed work on a draft master plan and will continue to move the project forward. Guided by the “three E’s” — economy, environment and equity — the plan for redevelopment of the 164-acre county-owned Alliant Energy Center campus includes expansion of the Exhibition Hall, additional hotel facilities, enhancements at Willow Island and interior streets featuring restaurants or other amenities, as well as a focus on stormwater management for the entire site. The project is part of a broad effort to transform the property into a catalyst for economic development by attracting more visitors and creating new opportunities for the adjacent neighborhoods in south Madison. Funding was included in the 2019 budget for predesign of the Exhibition Hall and stormwater management work. Information on the project is at https://aecstudy.countyofdane.com. Finally, the board is redoubling its commitment to inclusive community engagement as a cornerstone of our work. In 2018, we launched the “Engage Dane” initiative to formalize the board’s engagement efforts, particularly to reach communities that may not currently participate in the county government debate, thereby improving representation and transparency. More information is available at https://board.countyofdane.com/Engage-Dane. As Dane County grows and becomes ever more diverse, it is our responsibility to make inclusive engagement a hallmark of our efforts. It is not enough to hold a meeting and hope interested parties will be able to attend. We must commit ourselves to seeking out input on issues of the day and do so early and often. Over the course of the year we met with various community groups to learn how to best connect. A report of these efforts will be released early in 2019. I am confident our efforts to be intentional as we interact with Dane County residents will lift public discourse and have a positive impact on the decision-making process. These are just three examples of the County Board’s work. Of course, there are many more including efforts in the areas of criminal justice system improvement and affordable housing. We have accomplished much, and there is much yet to accomplish. Most importantly, your voice matters. Because your County Board supervisor is also your neighbor, it is easy to contact them directly with a phone call or email and you can generally expect a personal response in a timely manner. The contact information for members of the board is available at https://board.countyofdane.com/Supervisors. If you want to know who your supervisor is, go to https://myvote.wi.gov/en-us/MyElectedOfficials. We hope to hear from you in 2019! Sharon Corrigan is chair of the Dane County Board of Supervisors.